Studio Line: DreamWorks - Freedom is not given. It is our right at birth. But there are some moments when it must be taken. Based on a true story, the movie chronicles the incredible journey of a group of enslaved Africans who overtake their captor's ship and attempt to return to their beloved homeland. When the ship, La Amistad, is seized, these captives are brought to the United States where they are charged with murder and await their fate in prison. An enthralling battle ensues that captures the attention of the entire nation, confronting the very foundation of the American justice system. But for the men and women on trial, it is simply a fight for the basic right of all mankind…freedom. Box Office: Budget: $40 million. Opening Weekend: $4.661 million (322 screens). Domestic Gross: $44.175 million. DVD: Widescreen 1.85:1/16x9; audio English DD 5.1; subtitles none; closed-captioned; single sided - dual layered; 24 chapters; rated R; 155 min. ; $29.99; street date 5/4/99. Supplements: Production Notes; Cast and Filmmaker Bios; Theatrical Trailer; Behind The Scenes Featurette. As I’ve noted elsewhere, Steven Spielberg experienced almost unprecedented success in 1993. While Jurassic Park cleaned up at the box office - it still maintains the fifth spot on the list of all-time top-grossing movies - and Schindler’s List walked away with multiple awards, including the Oscar for Best Picture. It may not be an exaggeration to claim that no other director has had such a prosperous year with the exception of 1939, when Victor Fleming dominated cinema with both Gone With the Wind and The Wizard Of Oz. Spielberg tried to recapture the magic in 1997. In May, he released The Lost World, the sequel to Jurassic Park, and in the fall, he put out Amistad, another epic battle against oppression in the same vein as List. However, duplicating the success of 1993 proved impossible. Lost World did fairly well financially, as it took in $229 million, but this represented a significant decrease after the $356 gross of Park, and both critics and fans viewed it with much less fondness. Nonetheless, the greeting accorded World seemed rapturous compared to what occurred when Amistad appeared. At least World inspired a reaction; Amistad moved in and out of multiplexes in a hurry, and it generated none of the passion and positivity encountered by List. Most of those who did see Amistad thought little of it, and the movie seems destined to become one of Spielberg’s most obscure. Personally, I felt the film was doomed from the start. Set in 1839, the opening shot felt like an outtake from Jurassic Park, as we watched a violent lightning-punctuated rebellion aboard the slave ship “La Amistad”. The slaves kill some of the crew but retain enough to navigate back to their homes in Africa. Unfortunately, the sailors betray them, and they end up in America. There they’re taken captive and a legal battle emerges in regard what will become of these people. I nearly choked on my popcorn during that mawkish scene, and it punctuates everything that’s wrong with Amistad. Spielberg was able to demonstrate some layers of moral responsibility and depth with other dramatic flicks such as 1987’s Empire of the Sun and List, but he became the sentimental hack many believe him to be when he strongly involved black characters. Between Amistad and 1985’s The Color Purple, Spielberg created simplistic tales of absolute right and wrong that betrayed no sense of character nuance or dimensionality. At least Purple avoided one of the main problems with many films that examine black-related subjects. From Mississippi Burning to Cry Freedom, these flicks often focus too strongly on white participants on the periphery instead of the blacks who deserve the lead. Purple largely omitted white participants, but unfortunately, Spielberg refused to concentrate mainly on the Africans during Amistad. Instead, Baldwin became the primary role, and rather than examine the Africans and their situation, the movie largely consists of a tale about Roger’s moral awakening. In this way, it seemed excessively obvious and simplistic. Roger walked through various stages of awareness in a plodding manner as he attempted to free the slaves and demonstrate that Africans are people too, not just product. His quest went all the way to the Supreme Court, where former president John Quincy Adams took the mantle to argue the case. As a whole, Amistad felt quite contrived and calculated. As with Purple, much of the movie allowed no room for interpretation or discussion; it was totally divided into extremely clear distinctions between good and bad. Granted, there’s not a whole lot of room for argument when it comes to slavery; I won’t disagree with Spielberg’s contention that such a practice is a uniformly bad thing. However, the movie suffered because it cast the characters into similarly black and white notions. Only Roger possessed any form of vagueness, but those attitudes existed as nothing other than a plot device to allow Spielberg to beat us over the head with this message. What exactly was that message, by the way - that slavery’s bad? Don’t we already know this? Are there many who argue otherwise? Because of the obviousness of the film’s point, it seemed point-less. While the revolt of the Amistad slaves was an interesting historical piece, it doesn’t really translate well into a modern parable. I felt that Spielberg wanted to use Amistad as a treatise on current racial attitudes and a plea for tolerance and understanding, but the story doesn’t fit cleanly into that profile. Instead, the tale came across as little more than another heavy-handed and self-righteous condemnation of others who ever disagreed with the director’s notions. I certainly won’t defend slavery, but it’s a terrible mistake to try to view historical episodes purely through modern eyes. Our current notions eradicate the attitudes of the bygone era, which means that we can’t truly understand them. What seems horrific to us appears natural and normal to folks in different cultures and periods. Some would argue that as with the actions of the Nazis, slavery was absolutely indefensible regardless of the attitudes possessed within particular eras or societies, and I’d agree with that. However, Amistad should have displayed greater depth and nuance to the characters on the non-abolitionist side of the coin. Instead, it preferred to paint them as villains without any redeeming characteristics. This made the movie little more than a cartoon examination of the subject, and it lacked the scope that might have allowed it to breath. Speaking of which, virtually every aspect of Amistad battered home its messages. The Africans showed no depth themselves, as they presented little more than generic noble men and women totally without flaws. The movie indulged in some annoyingly cutesy moments to mock the American culture, while it never attempted to reverse the equation. That form of political correctness got old a long time ago; I’ve always hated the fact that it apparently is okay for one culture to criticize another in this way but the reverse would not be allowed. The unilateral oppressiveness of Amistad extended to almost every element of the production. For example, John Williams’ score allowed us no opportunity to think for ourselves. Instead, it battered us over the head with the movie’s forced emotions and reinforced the cheap nature of the storytelling. However, I won’t blame Williams for this, as I lay my criticism firmly at the feet of the director. With Amistad, Steven Spielberg once again gave his attackers ammunition, as he produced a movie that suffered from his main weaknesses but offered few of his strengths. I remain a Spielberg backer, but I have to agree with his detractors that the man apparently can’t leave well enough alone at times. The tale behind Amistad is a valuable one, but the movie itself badly simplified and dumbed down the story to the point where it became a sugary and sentimental piece of tripe. Amistad appears in an aspect ratio of approximately 1.85:1 on this single-sided, dual-layered DVD; the image has been enhanced for 16X9 televisions. Overall, Amistad presented a very fine visual experience that lost out on an “A”-level grade due to a few small issues. Sharpness uniformly appeared crisp and detailed. I detected virtually no signs of softness or fuzziness, as the movie boasted a high level of delineation and definition from start to finish. No jagged edges or moiré effects marred the presentation, but I did detect some slight edge enhancement on a few occasions. Print flaws appeared very minor. I witnessed a speckle or two, but otherwise the image consistently remained clean and fresh. Colors appeared quite lush and distinct throughout the movie. The hues were a strong point of the presentation, and they always came across as warm and natural, with strong rendering of the various tones and no concerns related to bleeding or noise. Black levels also appeared deep and rich, and shadow detail usually seemed appropriately heavy but not excessively dark. A few exceptions to that rule did exist, apparently due to some “day for night photography” that looked a little too thick. In addition, the lighting didn’t always accommodate the dark-skinned actors terribly well, and some of them got a little lost in the mix at times. Nonetheless, Amistad generally offered a very good visual experience. The Dolby Digital 5.1 soundtrack of Amistad also seemed positive, though one won’t confuse it with the more active presentations of flicks like The Lost World. Amistad mainly stayed with a fairly forward emphasis, as the soundfield largely focused on the front channels. Within that spectrum, the audio blended nicely as music and effects created a good presence. The music showed fine stereo separation, while the effects seemed accurately located and they meshed together well. Surround usage was somewhat limited for the most part, but a few scenes brought the rears to life well; for instance, the opening thunderstorm displayed quite active and engaging audio. These sorts of moments were rare, but since most of Amistad stayed with human dramatic elements, the restricted scope seemed appropriate for this sort of film. Audio quality appeared generally positive but not exceptional. Dialogue came across as consistently natural and accurate, and I detected no concerns related to edginess or intelligibility. Effects remained a fairly minor aspect of the mix outside of a few louder sequences, but they appeared clean and accurate, and they showed reasonable dynamics during logical scenes like the storm. Music displayed reasonable clarity, but I thought the score sounded somewhat trebly and slightly harsh. As a whole, the mix lacked deep and rich bass; low-end seemed decent but unimpressive, and that aspect most affected the quality of the score. Amistad can also be found in a DTS 5.1 version, but I don’t know if that one remedies some of my concerns. In any case, the Dolby Digital edition provided a good but unspectacular audio track. Amistad provides a few minor extras. 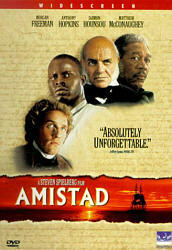 Most significant is The Making of Amistad, a documentary about the film. This 26-minute and 30-second program generally offers a promotional experience, but includes some interesting elements nonetheless. The show combines the usual mix of movie snippets, behind the scenes material, and interviews with principals. In the latter category, we hear from director Steven Spielberg, production designer Rick Carter, producer Debbie Allen, and actors Anthony Hopkins, Matthew McConaughey, Djimon Hounsou, and Morgan Freeman. This isn’t a deep program, as it does mainly exist to tout the film. Nonetheless, some of the actors’ comments are interesting, as they reflect on their roles and the subject matter, and we also learn a little about the story’s origins and why it got made into a movie. Best of the bunch are the shots from the set, which offer a lot of good glimpses of the program. Ultimately, this show isn’t anything special, but it provides a reasonably interesting and effective view of the production. A few minor supplements round out the package. In addition to the film’s theatrical trailer, we get some text materials. The Production Notes offer reasonably detailed and compelling details about the project, while Cast and Filmmakers includes biographies of Spielberg as well as actors Freeman, Hopkins, McConaughey, Hounsou, David Paymer, Pete Postlethwaite, Nigel Hawthorne, and Stellan Skarsgård. These entries seem fairly brief and perfunctory. While I expect Steven Spielberg’s heart was in the right place when he made Amistad, he didn’t have his head screwed on well. He laded on the schmaltz and cheap sentiment for this bland and obvious look at a quest for freedom and one man’s journey into enlightenment. Any powerful moments were undercut by the sugary emotions, and the overall package lacked much to make it worthwhile. The DVD provides pretty solid picture and sound, and it also tosses in a smattering of modest supplements. Though the tale behind the film has merits, Amistad showed Spielberg at his worst, and it seemed like an overbearing piece that should be left only for those who feel the need to see all of his films.